Small claims courts exist to enable people settle relatively small disputes, usually concerning money. With these courts, people can represent themselves and avoid hefty attorney fees as well as other court fees. By their very nature, they’re simple, cheap, and relatively fast. However, not everything in a small claims court is straightforward. The hardest part is usually in collecting a judgment when the judge sides with you. There are many reasons that make it hard to collect a judgment. Before we get to them, let’s go over some reasons why you may need to file a case in a small claims court. To recover unpaid rent – If you’re a landlord and have successfully evicted a tenant for nonpayment, you may take your former tenant to a small claims court to try and recover your money. To claim money for an injury – If you get injured due to someone else’s negligence, you can claim recovery of medical bills as a result of treating those injuries. To recover borrowed money – If someone borrowed money from you (typically less than $1000) and they’re refusing to pay back, you can take them to a small claims court to force them to pay you. To recover your security – Some landlords hold on to a tenant’s security deposit for whatever reason. If this happens to you, a small claims court may help you recover your security deposit. Reclaim money for a pricey purchase gone wrong – You recently bought an expensive item but realized that it’s not what it is touted to be. 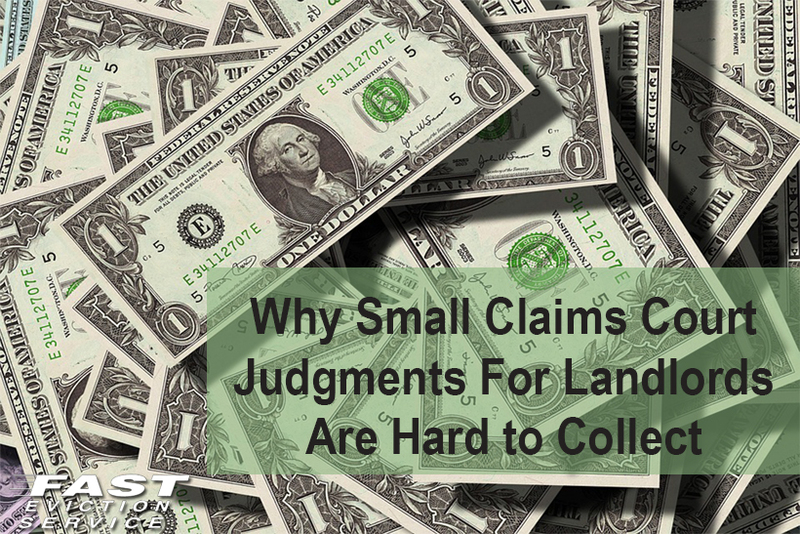 A small claims court can help you recover your money. Costly enforcement – The costs of enforcing a judgment make it hard to recover the money. Once you’ve exhausted all avenues to collect your judgment, enforcement proceedings are your last real resort. First, you need to track the judgment debtor and locate their address. You may also need to get their employment details. What’s more, you need to invoke other legal means in order to enforce payment and all these measures cost money. Depending on your situation, it may not be worth it to pursue enforcement proceedings. For instance, if you need to spend $500 to recover $1500, it might be better to save the $500 considering the fact that small claims debtors usually don’t pay 100% of the money they owe. It’s no surprise that many people simply give up altogether. Legal and illegal maneuvers – Judgment debtors have a couple of options at their disposal that enable them to either prolong or frustrate judgment collection. For instance, some judgment debtors hide their assets and income status so efficiently that they make it impossible for those assets to be attached. In other instances, a judgment debtor may file for bankruptcy. When you’re faced with such a debtor, you may have to spend a lot more money to track their assets and unearth their income status and then try to invoke an appropriate legal provision that allows you to enforce payment, for instance via his employer. Debtors can be hard to trace – A judgment debtor who is determined not to pay will go to lengths to make it hard for you to track them down. It’s not unheard of for a judgment debtor to change address once they learn that you’re tracking them or that you found out his address. Judgment collection can be frustrating and time consuming. Before filing a case in the small claims court, do a thorough background check on the defendant to determine whether they have the means to pay. In addition, understand that you’re likely to spend more money to recover the original money you’re demanding. Otherwise it might be better to write off the debt and avoid further frustration and time wasting.